HealthCare.Gov Woes Frustrate Last-Minute Shoppers And Helpers : Shots - Health News People turned out in droves Monday to sign up for health insurance through the Affordable Care Act. They found long lines and eager helpers. Some will have to return later to finish up. Last-minute health insurance shoppers turned up in record numbers Monday, both online and in person at clinics, county health departments and libraries. They were there to sign up for Obamacare on the last official day of open enrollment. Public radio reporters checked out the scene in Ohio, Pennsylvania and Houston — three of the 36 states that are using HealthCare.gov — as well as in Minnesota, which has one of the most troubled state-run marketplaces. A steady stream of people filed through the doors of the Neighborhood Family Practice free clinic, but Leah Pallant, an outreach and enrollment coordinator at the clinic, expected many of them to leave without actually selecting a plan before the midnight deadline. "The website is already in and out," Pallant said. "The number of people on the website really made it difficult to keep working because it basically just shuts you out entirely when they have too many visitors." Federal officials said more than 1.2 million people from around the country had visited by noon Monday, and the site was handling as many as 125,000 people at a time. The site was down from about 3:20 a.m. until 9 a.m. for maintenance and then again around midday. At other points during the day it shunted people into a "virtual waiting room." Coordinators in Ohio and across the country encountered many of the same problems as people trying to sign up at home. Pallant's colleague, coordinator Jackie Mostow, was working with Cleveland resident Callie Williams. "We can try," Mostow told Williams, "but what we might end up doing is trying to create an account and we'll schedule you an appointment to come back." Williams, who hasn't had insurance since the 1990s, said she is willing to wait a bit longer. "Just schedule me an appointment to come back," she said. Local health officials say sign-ups in the Houston area reached 114,000 a week ago. But a crush of last-minute enrollments over the past few days could push the final tally much higher. City officials announced that six community centers would stay open until 10 p.m. Monday to allow people more time to try to enroll. At the city's service center on the southwest side Monday afternoon, more than 200 people were crowded into the lobby and down two hallways. There were seven health-care navigators on site, according to Solly Diaz, a division manager for the city. "We expected and we braced ourselves for it," Diaz said. "We definitely ramped up our capacity. But even with that, the volume of walk-ins that we got was truly overwhelming." Navigators like Sandra Rodriguez helped clients do the bare minimum: set up an account, which would at least qualify them for an extension until mid-April. Around 2 p.m., Rodriguez turned from her keyboard, announcing a digital breakthrough. "So now at 1:53 in the afternoon, after I've tried since 8 o'clock in the morning, we're able to get into the system," she said. "We're going to start the application." The lucky client at that moment was Pamela Thompson, 50, a food worker in a school district. Thompson recently found out she has high blood pressure, and she also had the flu this winter. "I've been needing insurance because, you know, I stay sickly lately," she said. "And when I want to go the doctor I have to pay out-of-pocket to go." By midafternoon Monday at Latino service agency Congreso in North Philadelphia, about 50 people were signed in, waiting to meet with Congreso's bilingual staff. And the list was growing. Jose Rivera, Congreso's vice president of health services, says he's excited that they've been able to connect with so many people, even as Latino enrollment nationwide appears to be low. Twenty employees have become certified application counselors at Congreso, according to Rivera, in addition to their regular jobs. Counselors reported long waits getting through to the Spanish-speaking help line on Monday. MNsure, the agency that runs Minnesota's online insurance marketplace, braced for high volume Monday, and procrastinators didn't disappoint them. The call center fielded a record 16,000 calls. 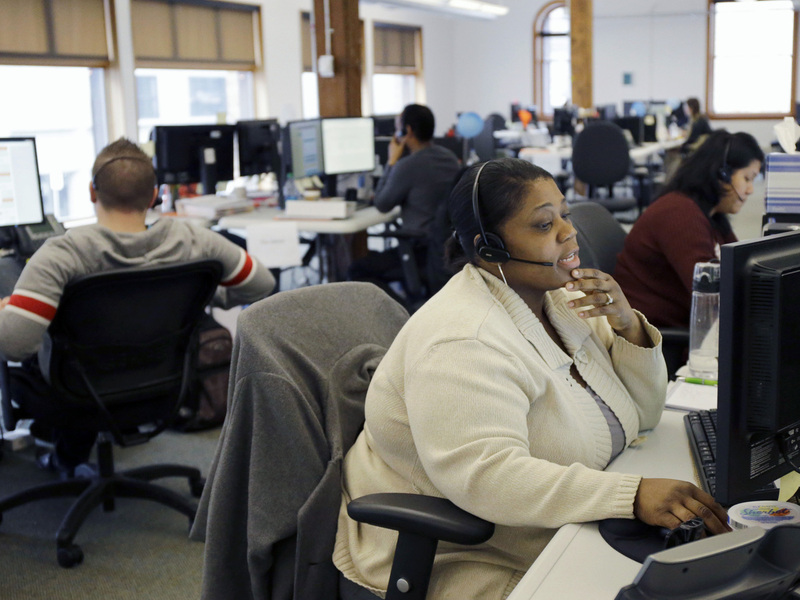 Loretha Cager talks with an applicant at MNSure's call center in St. Paul, Minn., Monday. 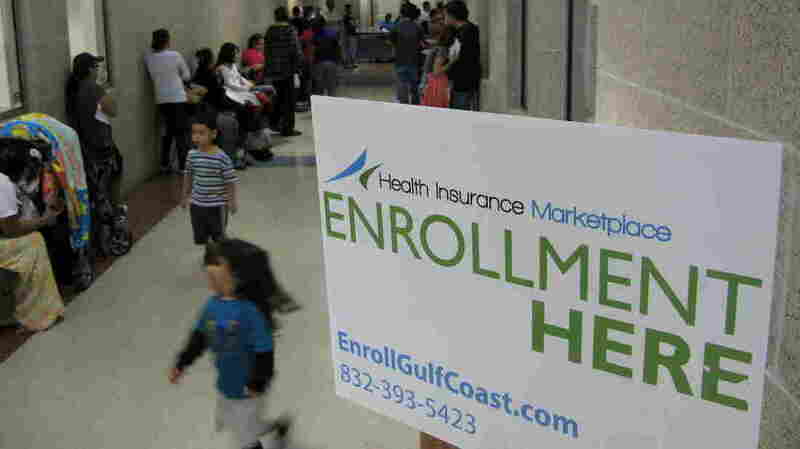 Monday was the open enrollment deadline for signing up for insurance under the Affordable Care Act. 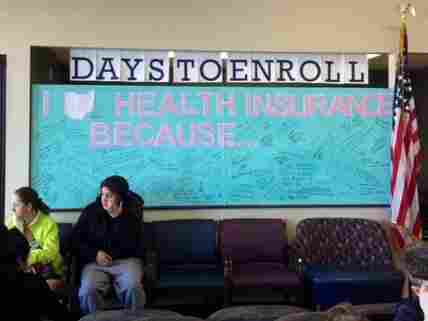 The website slowed, but it did not buckle as it did Dec. 31, the last big deadline for enrolling in coverage. On that day, frustrated Minnesotans who needed coverage to start Jan. 1 overwhelmed the call center. But Monday's rush showed that the MNsure website has improved. MNsure also followed a consultant's advice and added 100 representatives to its call center. "We've added additional capacity for the surge to the site to ensure that people are able to get in and that the system itself can handle additional volume," interim CEO Scott Leitz said. "Beyond that, we're monitoring by the minute the stability of the site and where things are at." MNsure officials say there are still hundreds of people stuck in insurance limbo, whose cases are deemed "pending." One of them is Susan Leem of St. Paul, a married mother of two whose current insurance expires in April. On March 6, when she first applied, the site said she and the children qualified for Medicaid, but Leem doubts that because of her income. She needs coverage to begin Tuesday, but her case is still pending. This story is part of a reporting partnership that includes NPR, member stations and Kaiser Health News.